Tiger Beatdown › My, What An Interesting and Exciting Day! Metal in America has never been a particularly urban movement; its environment is mostly suburban or rural, and its stronghold is traditionally the Midwest. The image of the stereotypical metal fan – young, white, lower or middle class – has been firmly entrenched in American pop-culture since the late ’70s… the circumstances of [two Priest fans’] lives can tell us a good deal about the social circumstances of a large portion of metal’s most fervent mid-’80s American fans. [They] both grew up in fractured families in a lower-middle-class area of suburban Reno; had histories of depression, substance abuse, and violence; and used their obsession with heavy metal as a way to define themselves as part of an oppositional subculture. All of this is quite true, and well written. I’m so glad that Slash married a woman who shares his love of ridiculous hats. Having established that Brian DeLeeuw’s piece is the clear winner here, perhaps it would be good to point out some places it could have gone! For example, I think DeLeeuw underplays the scary/fascist elements of metal – and understandably so, because I think everyone of a certain age recalls the hysteria which led certain people to believe that “We’re Not Gonna Take It” advocated the widespread tossing of parents out of windows. Still, those elements are worth a look. Yes, a lot of metal albums provided identities and revenge fantasies for suburban dweebs, but they also played into the idea that some people (yeah, THOSE people, you know them) need to be put in their place – and it was easy to work certain agendas into that framework, or to read them in. Then, too, there’s the fact that the whole hail-Satan element of metal really only works in a culture in which Christianity is not merely an option, but the option, which does a lot to explain the suburban and Midwestern popularity of metal, and is also why I am not surprised (though DeLeeuw is) to find that one of the only remaining all-metal radio stations is run out of a Catholic school. 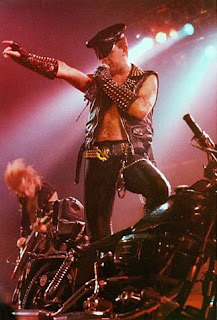 Metal was a culture of opposition, sure, but one which only challenged certain (I would argue) superficial elements of the dominant culture – it was basically against anything that kept white straight dudes from doing whatever the hell they wanted without getting in trouble for it. Metal is the Libertarian party of rock. *Big Bear has a Wikipedia page. I consider this to be the finest achievement of American culture. I also particularly enjoy their early, ominous slogan, “You’ll Be Surprised by a Big Bear.” They never really dropped the “a giant bear is going to eat you” gimmick, as evidenced by the realistic, life-sized bear – posed with slavering jaws opened wide and one monstrous paw raised for the kill – that crouched atop the freezers in the frozen food section of our local outlet, which made me cry whenever I saw it for much of my young life. That’s branding! This was written by Sady. Posted on Wednesday, November 19, 2008, at 10:54 am. Filed under Uncategorized. Bookmark the permalink. Follow comments here with the RSS feed. Both comments and trackbacks are currently closed.